In 1918 Nick Tahou founded the restaurant that would create one of Rochester’s best known dishes. Almost a century later Rochestarians still flock to Tahou’s to devour its namesake, the Garbage Plate. Many local restaurants have jumped on the bandwagon, but having trademarked the name you can only have a real “Garbage Plate” at Nick Tahou’s. I am a little bit embarrassed to say I have never had a Garbage Plate, but in my college days I witnessed plenty being eaten. In retrospect, I probably should have taken the plunge and dug into one as “research” for my Garbage Plate Pizza recipe. The hot sauce is what I was told makes the plate. I googled Nick Tahou’s hot sauce and found several recipes that were exactly the same and I thought they had to be right. But this is where my “research” would have been helpful as the recipe called for tomato paste, all spice and cinnamon. The hot sauce wasn’t very hot and was a bright shade of red which didn’t look anything like the pictures or plates I had seen being eaten. But I continued anyhow. After pre-baking the dough I spread on a thick layer of the hot sauce which included ground beef and onions. I sprinkled on mozzarella cheese and then a layer of home fries. I let this bake for about 15 minutes and then took it out to put on the finishing touches. In the center of the pizza I heaped on macaroni salad and then Andrew drizzled on ketchup and mustard. The Garbage Plate Pizza was one of the most massive pizzas I have made yet, getting all the components in one bite was a challenge, but we met that challenge. The pizza was absolutely fantastic! The sauce was definitely not the right sauce to use and was not hot either, but it was still delicious. 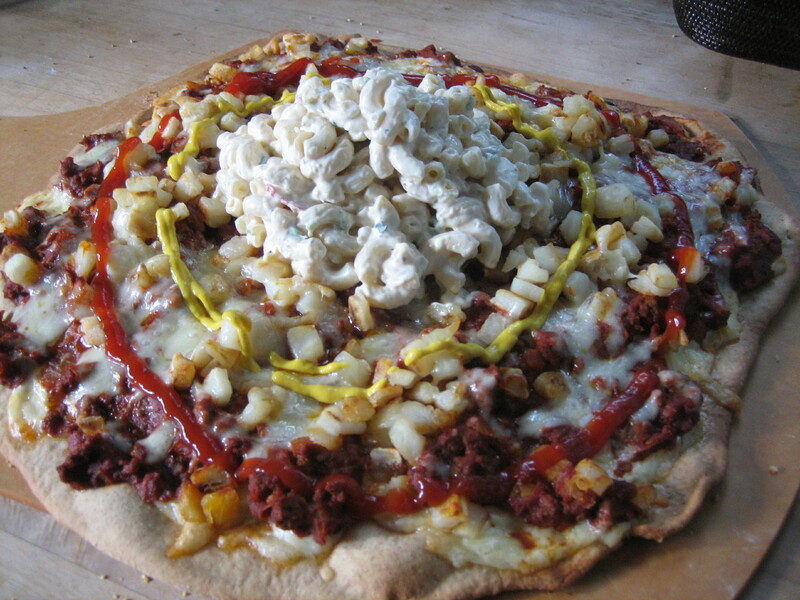 I would like to take another crack at my Garbage Plate pizza recipe and definitely do a little “research” beforehand. I’m sure Andrew will be up for some “research” as well!